Not long till Cycle Sunday! Bristol’s family-friendly Cycle Sunday event, which we are supporting, is back on Sunday 16 September, 10am to 2pm. Now in its fourth year, Cycle Sunday attracts up to three thousand participants. 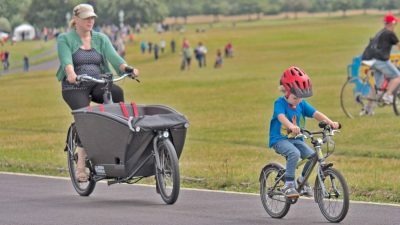 Its success has demonstrated the huge amount of interest in the Downs as location for bike riding especially for children, who need plenty of space and a lack of hills to develop cycling skills and stamina. 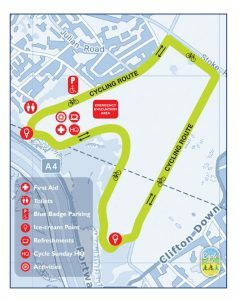 This year the route has been extended to include Ladies Mile, which along with Circular Road will be closed to cars so that people can enjoy a relaxing 3.5km bike ride around one of the most beautiful areas in Bristol. We will also be supporting the Bristol Bike Festival who will be bringing their quirky Carnivelo up from the centre of town to join the event (please see our What’s on page). The Family Cycling Centre will be there with specially-adapted all-abilities bikes. And, as ever, participants will be able to get their bikes checked for free by Dr Bike, try out bicycle paint spinning and make a pedal-powered smoothie. We will also be there with our information stall calling on everyone to support our new ‘ask’ for safe space for cycling on the Downs.